Lab managers, architects and engineers who specify laboratory and production environmental rooms are often faced with a dilemma. At the budget stage of a project, end users seldom know exactly what temperature and humidity conditions and tolerances will be necessary in each room. This often results in problems at bid time. Specification changes which appear to be minor can in fact result in major differences in project cost. Other apparently major changes may not affect the suppliers’ cost at all. This guide is meant to assist the architect during the early stages of a project when environmental control requirements are discussed with room users. It shows how the principal types of rooms differ from each other, and at what points specification changes lead to increased costs. Cycling Chambers in which the environment is changed from one specified temperature and/or humidity level to another in a very short period of time. Clean Rooms where atmospheric humidity is kept at very low levels - below a -10ºC dewpoint. Environmental Rooms in which the temperature and/or humidity level is controlled at a single set condition within specified tolerances regardless of activity in the room. Cold Storage Rooms where the temperature is controlled below normal comfort levels, but where there is no process requiring close-tolerance control or human activity. 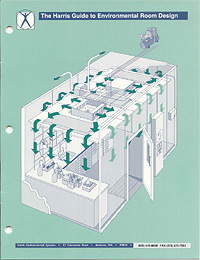 This guide discusses the last two types of rooms - environmental rooms and cold storage rooms. Confusion sometimes arises between these because in both cases, the temperature is the main variable under control, and architectural details for both facilities can appear similar. An environmental room is more costly than a cold storage room because control tolerances are tighter. Also, heat and moisture loads are higher and more variable. We will discuss each of the key variables in the room specification, and describe how they lead to differences in project costs.